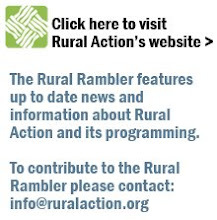 The Rural Rambler: Become a Fan of Rural Action of Facebook! Become a Fan of Rural Action of Facebook! For all of you Facebook folk out there- become a fan of Rural Action on Facebook! Find out more about what we're working on, check out upcoming events and workshops and read the Rural Rambler, all in one place! We'll be posting pictures (and we'd love to see yours too!) we'll have some fun contests and we're looking forward to gaining more feedback from members utilizing this popular networking tool! So head on over to www.facebook.com/ruralaction and "Like Us" would ya? Greetings! Nice to see the extended family from around the new ancient forest.